Sea You There: Did You Know Blue Tokai Now Has A New Address Near The Beach? The Indian coffee roasters have opened a new outlet in Versova. Their fourth place in the city, Blue Tokai in Versova is a cosy corner on the main street which houses all the frequented haunts of this area. A long area perpendicular to the road, the Versova café has seating inside and outside in its porch. And this one’s open till midnight, so you can satiate your coffee craving even at wee hours. Started by a couple who are passionate about serving you a premium cup of coffee, Blue Tokai wants to bring Arabica coffee to its patrons that is made of beans cultivated and roasted in the country. Known for educating people through workshops, as well as developing the taste for one of the best coffees worldwide, Blue Tokai also makes sure your coffee reaches your doorstep within 48 hours of placing the order (they sell their entire range of coffee online). They also have a subscription model, and other interesting gift hampers to choose from that take online orders for. The Versova Blue Tokai, following in the format, has a hot and a cold brew menu to choose from. The cold brews, yummy as we’d like to add, has espresso-based drinks starting at INR 110, and black coffee options for INR 150. 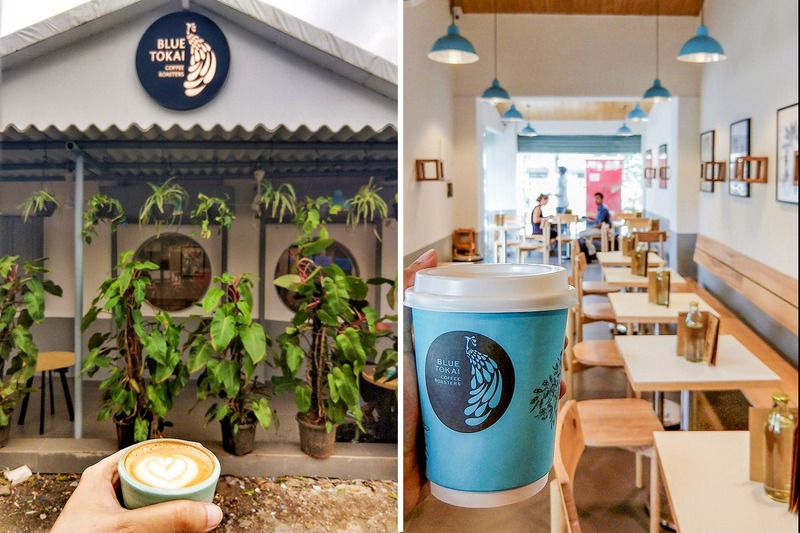 If you’re just starting out, they also have a tasting menu (INR 330), which serves three options that include Iced Latte, Cold Brew and Nitro Coffee. Their hot brews follow the same format as cold brews and are priced similarly. But the highlights from this menu are Flat White (INR 140), and Siphon Coffee (INR 250). In any of these variants, you can choose to add almond, soya, or lactose-free milk at additional cost. As Blue Tokai doesn’t have a kitchen of their own, this outlet also has a collaboration with Magazine Street Kitchen and Gouri of Gouri’s snacks that work as perfect accompaniments with your coffee. Blue Tokai has other outlets in Mahalaxmi and Bandra. Quit instant coffees, and grab your authentic premium cup from Blue Tokai which now has Versova covered. Blue Tokai also wants people to understand that oxygen and moisture are coffee’s worst enemies. Any packet of coffee should be consumed within 21 days of opening the packet if you wish to enjoy the real taste with its aroma intact.